The University School (F.L.) returns this season as one of the top teams throughout the country. The Sharks came up just short in the Geico Nationals Championship game last year to Montverde Academy, so there is plenty of motivation heading into this season. Contrary to most of the programs ranked this high on the list, the University School isn’t a boarding school. This is one of the few reasons why their program is so special. With head coach Jim Carr leading the way and having prospects like Vernon Carey and Scottie Barnes on the team the Sharks are capable of beating anyone in the nation. Carr is taking it day by day with this group. 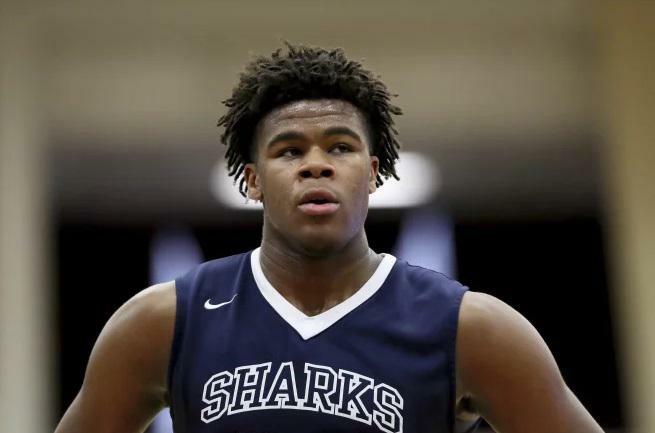 It’s tough to decide on one star between five-star Vernon Carey and five-star Scottie Barnes, but if one needed to be chosen it would be the senior Vernon Carey. Carey makes a strong case that he should be regarded as the top prospect in the class of 2019. With his size and physicality at 6’10”, athleticism and continued improvement with his skill set Carey is unstoppable on the high school level. Like they did last year, the Sharks will look for the senior big man to lead the team on both the offensive and defensive end. There is a lot to like about this year’s team and as much you want to look at just Vernon Carey and Scottie Barnes, the Sharks are more than that. Their frontcourt has depth with prospects like Jace Howard and Jalil Beaubrun and their guard play will be highlighted by talented players like Roger McFarlane, David Perez, Jett Howard and Logan Alters. Coach Jim Carr broke down what he sees from some of his players this upcoming season. The University School had one of the most successful seasons last year with a City of Palms Championship, being a runner up in Geico Nationals and more. Head coach Jim Carr attributes that all to how unselfish the team was. It’s not often you see a team that was this successful return to this year as possibly being even better. The Sharks are not a team to be messed with and should drive opponents crazy all year long. ©2019 PrepCircuit High School Basketball News, Rankings & Stats / SportsEngine. All Rights Reserved.